Wow. This week has definitely been a big one. 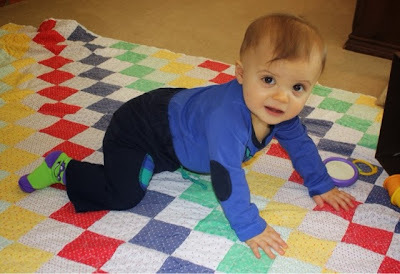 First, I blogged about how Patrick is onto eating solid foods AND that he's been outside in the world longer than he was growing inside. 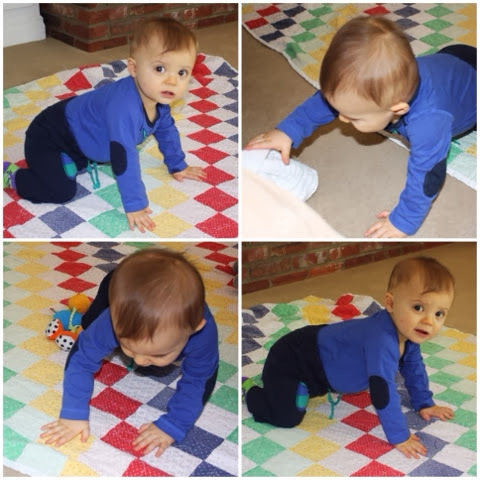 Well, another big milestone has happened for my little guy this week: he officially is crawling. Now, don't get me wrong, he has definitely been mobile and moving for a month or two: scooting, pushing himself backwards, and rolling have all been his primary mode of transportation to get from point A to point B. 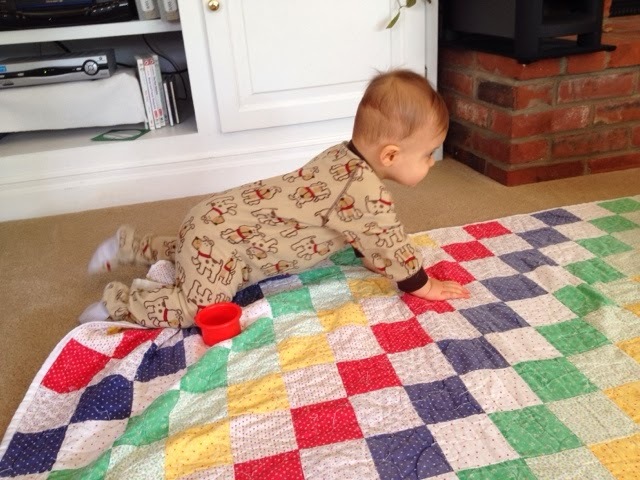 However, until today, he has never officially crawled (and I actually thought he just wouldn't--he has been getting around fine with his scooting and rolling methods, I figured that's what he'd stick to until he started to walk--oh, how wrong I was). But, as of this morning, little man is officially crawling. Cue mom tears. 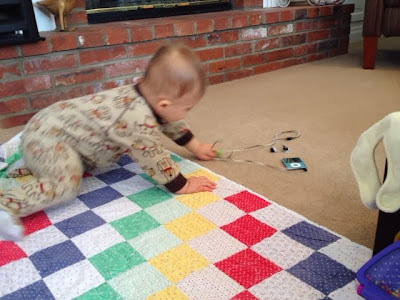 And I'm 100% serious when I say he literally started crawling today. Cause last night I had him down on the floor, tossing his ball at him (we're really working hard on catching...we have an insta-challenge going on with Tiff's Huck and Lauren's Cam, and we been practicing A LOT lately...mostly to keep his eyes OPEN and on the ball :), and he would just flop down and roll if he wanted to get somewhere. So honestly, last night he was still doing his own rolling/scooting thing. 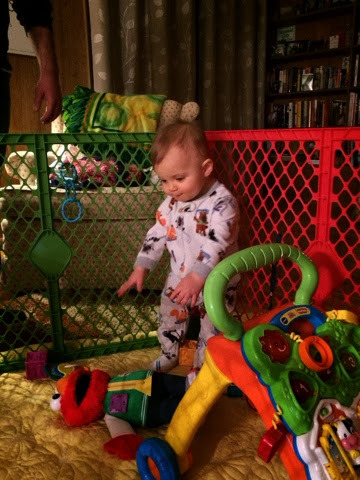 Although he did push himself up (using his baby jail gates as support) to standing, and totally just chilled there, watching Baby Einstein, like he'd been doing it forever. He'd even bend over to pick up a toy and then stand back up. Mike and I were standing there with gaping mouths as he was doing it. 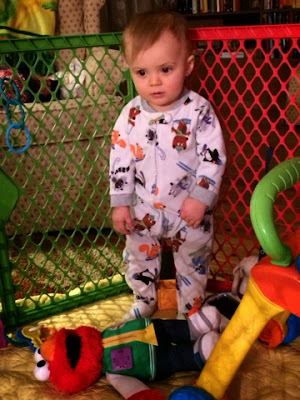 Then, of course, I snapped to and had to snap some photo proof of his standing. I know I totally am coming off as this "OMG! My baby did ____ today!!" mom. But this is something I haven't ever experienced before with a little human--my little human--so I want to document it! Side note: if Instagram ever goes away, I'm screwed. 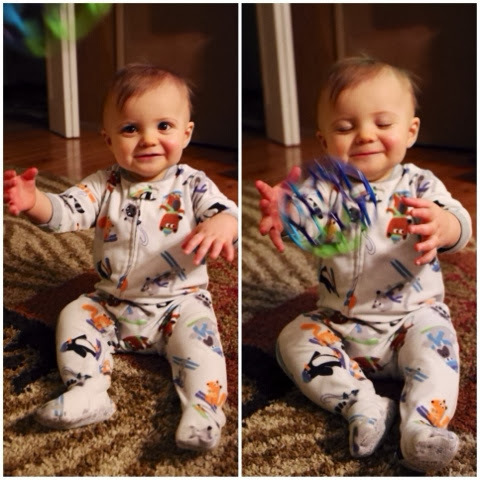 That's my digital photo book of this kid's life! Oh, Instagram, pleaseeeeee never go away!! Side note: this app is amazing to go back and look at old Instagram posts from specific dates (it has a calendar view! the best). And I'm so glad I opened this blog back up to document all of his progress and milestones. Cause, and I've said it before, if for nothing else, I hope Patrick reads this one day and sees all the stuff I documented of his early life. And I really hope I'm this good about documenting future kids too. Fingers crossed on that one.